The Democratic National Committee has faced endless setbacks -- including some self-inflicted -- but finally seems to be getting up to speed. WASHINGTON — After a slow start, Democratic National Committee Chairman Tom Perez has been on a hiring spree. "When we got here, we had a lot of rebuilding to do," the former Obama labor secretary said as he approaches his six-month mark on the job. "We've already made a lot of down payments on the new DNC." 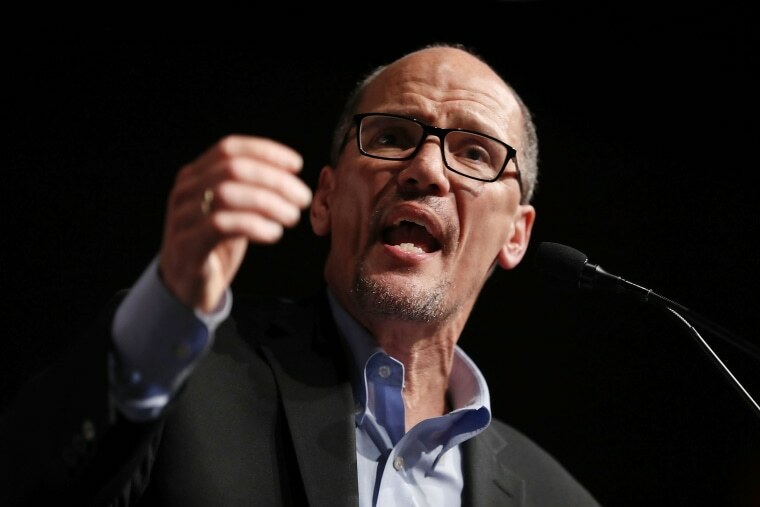 When Perez took over in late February, the DNC was down to about 100 employees — its lowest staffing level in recent history. Everyone remaining was told to submit a letter of resignation. Some, like the entire research department, were asked to stay and given raises; many others were let go. Since then, the committee’s bullpens and corner offices have been filling up again, with officials expecting headcount to top out around 200. Jess O’Connell, the former Executive Director of EMILY’s List, was enlisted into taking over as CEO. Raffi Krikorian, a top engineer at Uber who had never worked in politics, was recruited to lead technological innovation. And there's now new blood in almost every top position. It wasn’t easy to convince wary Democratic operatives to join such a beleaguered institution. Many had expected to be settling into jobs in the Clinton administration. As he makes the sell, Perez asks prospective employees what they want to tell their kids they did when Donald Trump was president. Perez lured Amanda Brown Lierman, an Obama administration alum, to become is the DNC’s new political and organizing director. "No doubt we have some repair to do when it comes to relationships. People need to regain some trust with the party," she said, noting the national party has significantly stepped up monthly payments to state parties. Her role is new for the DNC, which has not done organizing in recent years. The party wants to construct a permanent political infrastructure to help Democrats up and down the ballot all year round and in every zip code, starting this year with a major investment in Virginia. "At the new DNC — I've literally been trying to scream this in as many meetings as I can — there's no such thing as out-of-cycle," she said. The committee’s pink stucco headquarters near the Capitol are finally whirring back life, where the DNC has tried to fight Trump and stay involved in elections while executing its internal re-organization. The party has been trying to make itself relevant again to the grassroots, partnering with over 100 organizations for "Resistance Summer" events. And Rep. Keith Ellison, D-Minn., the DNC deputy chair, has taken a lead on hosting the party’s online talk show, "Democrats Live," which features interviews with some of the party’s stars. But fundraising remains a challenge as donors have shown wariness of the DNC even as they shower other anti-Trump "resistance" groups with cash. Monthly hauls have been below expectations, and that's starting to worry some Democrats. There’s also been frustration about the pace and progress of the party's transition, with many Democrats wondering what exactly the DNC has been doing since Trump came into office or doubting Perez' political instincts. Even before Wikileaks published hacked internal emails last year, which forced former chairwoman Debbie Wasserman Schultz to resign, there was widespread agreement that the apparatus had been neglected under the Obama White House, which became the locus of the party activity and worked through its own group, Organizing for Action. "Instead of investing in the party, the Obama White House and the Clinton campaign sidelined the DNC and attempted to duplicate its work. The result was a fusillade of congressional losses, and frankly, the most embarrassing presidential loss in history," said one former DNC staffer who requested anonymity to speak candidly. The new DNC's officials said it’s taken them this long to dig out of the hole they found themselves in. "All of us very much underestimated where the building and the organization was at and the work that it was going to take to get it on a strong footing," said DNC Senior Adviser Will Hailer, a former aide to Ellison. "It was a sinking life boat."